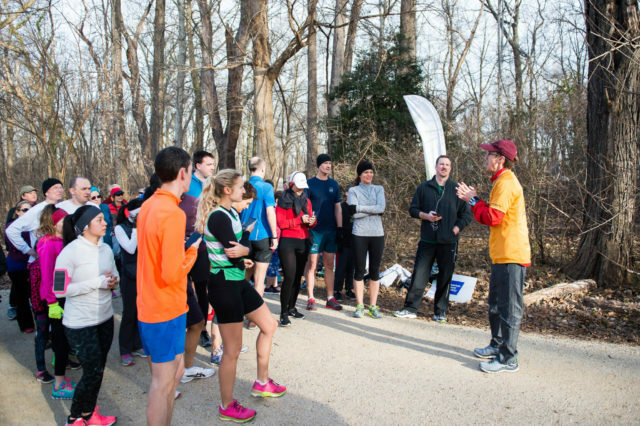 It’s not a race…parkrun finds its footing around D.C.
It’s Saturday morning on Fletcher’s Cove. A crowd of runners huddle together on the C&O Canal Towpath, ready to start their watches and run. At first glance, this may look like just a normal 5k, but on closer inspection, something is off. There are dogs in the crowd… children… strollers… No one is wearing numbers, there is no timing clock, no one is firing a starting gun. Only a few miles away, a similar crowd gathers on the wooded trails of Theodore Roosevelt Island. Another gathers on the paved path of College Park’s Paint Branch Trail. It’s something different: it’s a parkrun, a weekly running event growing in popularity around the world. In just one year, three parkrun events have started in the D.C. area alone. That’s right, a free 5k. To register for an event, it’s as easy as going online, typing in your name and clicking print. Participants receive personalized barcodes, which allow them free access to any parkrun in the world. Times are posted online within just a few hours of the run, sooner even than many paid races. To keep it free, events are entirely volunteer-led. It all began in England. There are now more than 40 parkruns in the metropolitan area of London alone. These are among more than 1,000 around the world. The first run had 13 participants. Now, every Saturday, more than 200,000 runners and volunteers turn up at parkruns in 17 countries. Yet parkrun is still fairly new to the DC area, and, were it not for Henry Wigglesworth, might not be here at all. Wigglesworth has enjoyed running for a long time, though his preferred distance has changed over the years. “The older I get, the shorter distances I like to run,” he said. “I really like the mile. I like track races.” In 2014, he won his age group in New York’s highly competitive Fifth Avenue Mile. Wigglesworth was on a trip to England in June of 2015 when he casually asked his friend if he knew of any runs nearby. His friend told him about a low-key event called parkrun. No entry fees. No prizes. Mostly families and casual runners. It didn’t sound like the type of event he was used to, but Wigglesworth decided to give it a shot, not anticipating much competition from its 200 participants. But when the run began, four or five fast guys took off right in front of him, leaving him in the dust. When Wigglesworth returned to the United States later that summer, he was introduced to Darrell Stanaford through a mutual friend. Both were interested in starting a parkrun together. Stanaford was not new to parkrun. While living in Moscow, Stanaford grew sick of sticking to the treadmill and yearned for more places to run. So he got involved with parkrun in Gorky Park. When he returned to the United States, however, he wanted to stay involved with the parkrun community. “Anyone can start a parkrun,” Stanaford said, though it’s not as easy as drawing a starting line and saying “go.” There are some necessary requirements. To begin a parkrun, you need a park permit, a team of volunteers and a one-time startup fee for equipment. To acquire all of this was no easy feat. In August of 2015, Andres Falconer joined the team, along with Diarmuid Coughlan. Falconer, who had lived in London, had been running parkrun for years. “It was second nature,” he says, “so I obviously missed parkrun a great deal when I left the UK and I was longing for the opportunity to run it again.” When he arrived in D.C., Falconer emailed Paul Sinton–Hewitt, the UK-based founder of parkrun, asking if there were any events in the area. Sinton-Hewitt responded, putting Falconer in touch with Wigglesworth and Stanaford. The team got together and held regular meetings at the Pret in Union Station. “It was like our office,” Wigglesworth says. They discussed things like getting permits from the park service, raising the money and best location, eventually settling on the C&O Canal Towpath for their first event. The inaugural race was held Jan. 9, 2016. It was attended by 160 participants, including D.C. Mayor Muriel Bowser. Andrea Zukowski and Colin Phillips, a couple from College Park, were also among those participants. “Every year we went to England, we would come home and say ‘man, we really need a parkrun in College Park,'” Zukowski said. “I was a late runner myself and I can appreciate what a transformative experience [running] can have on someone’s life.” So she went online and did the research, but thought it would be too difficult to raise the money and find volunteers. During the inaugural parkrun in Fletcher’s Cove, Zukowski and Phillips spoke with Wigglesworth and Falconer about starting a run of their own in College Park. That meeting gave them the confidence they needed. “The very next Saturday, we knew where we were going to have it,” Zukowski says. Roosevelt Island came next, Aug. 25, and College Park on Oct. 15. There are also plans for a new parkrun on the Anacostia Riverwalk Trail, beginning in late March or early April. Each run has its own unique vibe and attracts a slightly different crowd, though there is a sense of commonality among them all. While parkrun attracts all types of people, those looking for a fast run should not feel deterred. Parkruns are not without competition. The current course record at Fletcher’s Cove is 15:45. Many runners and volunteers attend regularly and form friendships. Participants of the College Park parkrun meet weekly for coffee afterwards at a local shop not too far from the finish line. “If you start a parkrun, you know what you’re going to be doing Saturday mornings for a while,” Stanaford says with a smile as he planted turnaround signs across the course at Roosevelt Island. In order to help others across the country begin their own parkruns, Wigglesworth and Stanaford formed parkrun USA, a nonprofit designed to promote parkruns across the country. Stanaford is the head of the organization. The could mean attracting lower-income runners who don’t have $35-plus dollars to spend on a race.